A Visit to the Afterlife in Coco | Kid Reporters' Notebook | Scholastic Inc.
Click below to see clips from Alula’s interview with Coco star Anthony Gonzalez. Coco, the latest animated movie from Disney-Pixar, tells the story of a young boy named Miguel and his eye-popping journey to the Land of the Dead. Growing up in a Mexican village, Miguel is passionate about music. But his family forbids him to perform. Miguel is undeterred. While pursuing his dream to become a famous musician, he finds himself in the afterlife with his dog, Dante. While in the Land of the Dead, Miguel learns about the musical gifts of his long-deceased great-great grandfather. 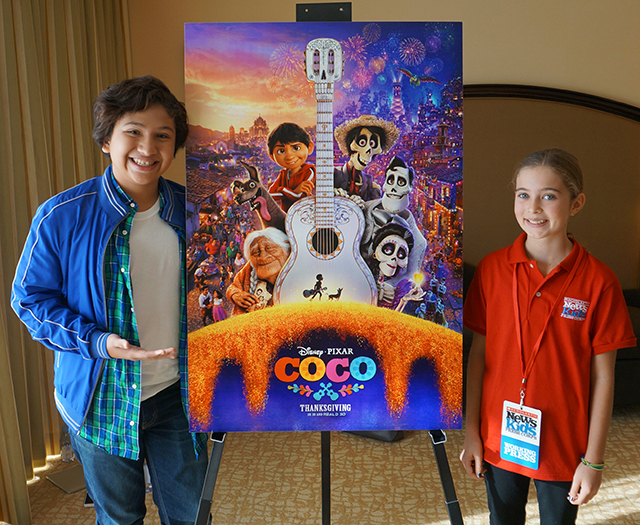 “The heart of Coco is basically about the importance of family and really never give up and do what you love,” says Anthony Gonzalez, the 13-year-old actor who voices Miguel. During a recent press event in Los Angeles, Anthony told me that he was “shocked” when he landed the role of Miguel at the age of 10. He was chosen from more than 600 young actors. At his first audition, Anthony read a few lines before launching into a song and wowing the filmmakers. Since the movie is computer-animated, Anthony voiced his lines in a studio rather than on a conventional set. To get into the character, he tried to imagine the story through Miguel’s eyes. “I would just express how I would feel [in the same situation],” Anthony said. Director Lee Unkrich and his team visited Mexico several times while researching the film. They were drawn to a traditional Mexican celebration called Día de los Muertos, which translates as “Day of the Dead.” Once a year, Mexican families get together to honor their deceased loved ones. That is what Anthony, who is of Latino descent, loves about the tradition. “It’s a day when you really take time to remember your ancestors who are no longer with you,” he said. The film opens on November 22, in time for the Thanksgiving holiday.